Cut shapes from scrapbook paper for the head, ears and feet. Use the photo as a guide. Attach the ears to the head with a glue stick. Use glue stick to attach the head to the cup (place cup upside down). Cut pipe cleaner in half and use white craft glue to attach the feet to the bottom of each one. Use a toothpick to poke two holes toward the bottom of the sheep's body and insert the pipe cleaners. Bend the pipe cleaners so that they hang over the edge of the table. Use the handle end of a paintbrush dipped in black paint to dot on eyes. You can add eyebrows with a black marker. 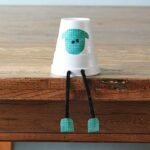 This project for Foam Cup Sheep was printed from CraftsbyAmanda.com - https://craftsbyamanda.com/foam-cup-sheep/ and can only be printed for education or personal use.